How, where and under what conditions is it worthwhile constructing a building? 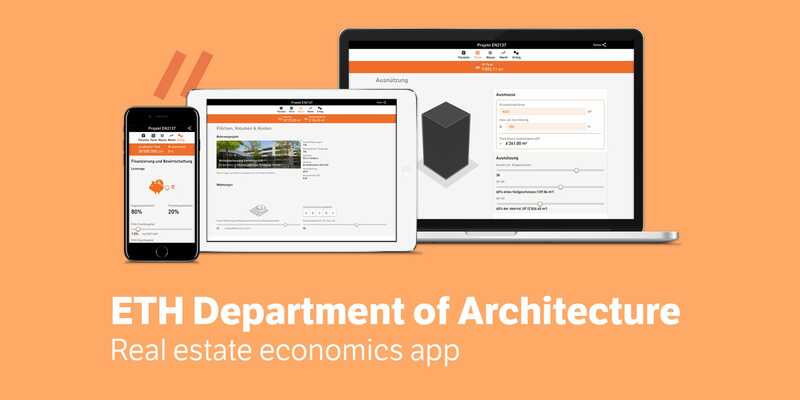 These pivotal questions were tackled on behalf of the Chair of Architecture and Building Process at ETH Zurich’s Department of Architecture, translating complex calculations for building costs into an app. Additionally, a core task was to digitise the five modules students go through during their studies. Calculations and formulae are transparent, while their impact is immediately visible. Moreover, baked into the app is a sense of humour, through which in particular the visual elements make the experience more fun and approachable, but also. put the fun back into real estate economics. By showing the connections with the app Liip has managed to make the math element of architectural studies approachable. The app can, of course, be used on all current devices, and is thus helping to digitise teaching. Digital learning in a digital classroom is a key topic at ETH. We are already making active use of the app and would like to thank Liip for their involvement. Our students are delighted – a maths-heavy subject has been brought to life.